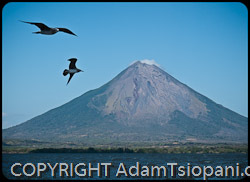 This shot was taken from San Jorge Harbour, Nicaragua and shows Concepción volcano. 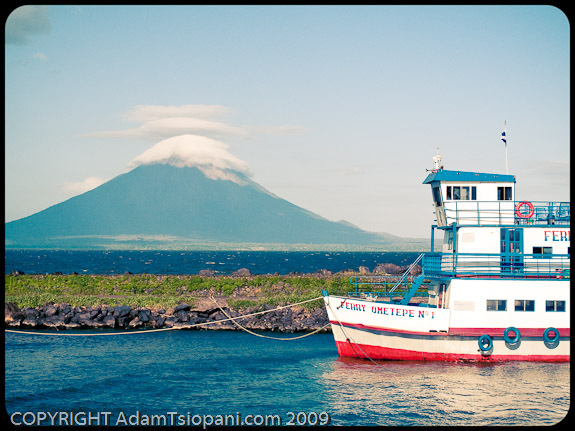 This volcano is one of two that forms the island of Ometepe, situated on Lake Nicaragua. The wind seems to attack these twin volcanoes all along their circumference, as if one hundred thousand archers surround the lake’s perimeter. The bows release their arrows in a sort of rhythmic harmony, ebbing and flowing in force and elevation, echoing the wilderness as the gusts penetrate these sandy shores. 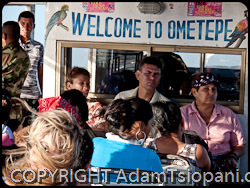 The wind here, it produces a different kind of wave than that of sea or ocean: flourishes of water, dancing pixie whisps, teased out of the surface of Lago de Ometepe. It is not a wind to chill your bones, nor does it carry a bitter rain. Au contraire, it is a breeze to cleanse and free the soul, shaking away your cobwebs. It is a wind complemented by the morning sun, like ying and yang, gentle rays reflecting a lucid, hazeless environment. I like the feel of it between my toes and in my long, ragged hair. I have begun to enjoy waking up early. No longer faced by the drudge, why waste away the day in bed? 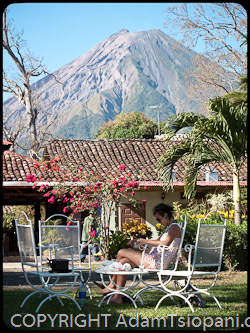 Why unnecessarily miss a second of this equatorial paradise? Even a late night hangover cannot pin me to the sheets, after all there are hammocks to enjoy! Yesterday, I needed cash. We had overspent our stay in El Porvenir (so easy in such a place, a lazy mountain farmstead), My mission for the day comprised a five hour return journey to Moyagalpa, a mere 25 kilometres on a mere dirt and rock track, for crisp Cordobas to pay our hosts. “What a burden!” I hear you say. Time moves differently here. Day to day, I am unaware of the date, or any name given to time. Long treks by bus or on foot melt into the ether; day turns to night, night to day. When your responsibilities and commitments – your stresses – lay dormant, time does not matter. It is inconsequential.